He's picky about AWD. We must have it (since we drive to snowy mountains), and only three makes come with the right mechanics for AWD - Audi, Subaru, and Acura. And since only the Audi Q7 and Acura MDX have a third row, our options are limited to cars over $60K. Personally, I covet the comfort and functionality of a minivan. After relentless puppy dog eyes, hubs convinced me to test drive Audi Q7's. I get it. I giggle over the performance and drool over the safety features and extra space. Instead, as soon as we returned from the dealer, I hopped on the computer and researched whether it was possible to fit 3 car seats (or 2 car seats plus one adult) in the back seat of an Audi A4. Aha! I found it on a discussion board! 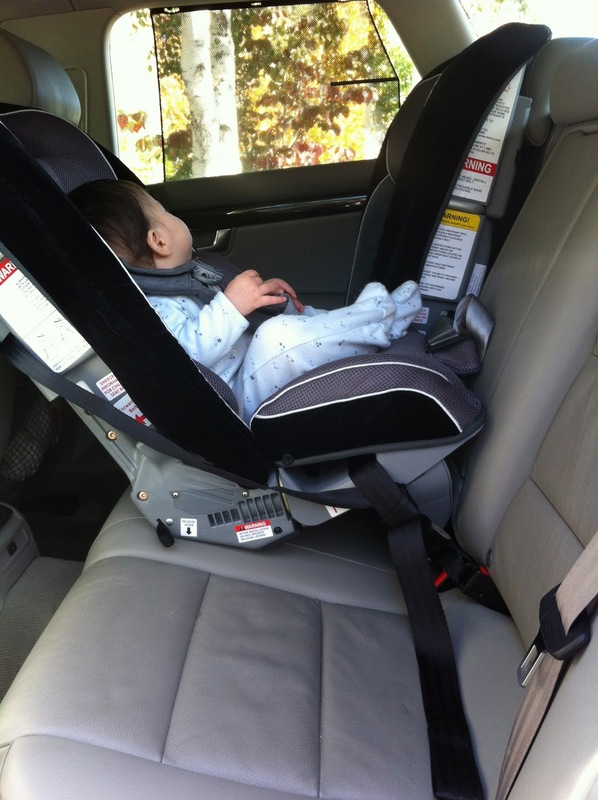 The Sunshine Kids Radian (now called Diono) car seats are extra narrow yet super safe, and three could fit! Here's proof. In the pic you can see the rear facing seat is in the middle and the front facing on the passenger side, leaving one full seat empty! This was an impossibility with our Graco and Britax seats before (trust me, I tried). Plus there's the added benefit that my baby slept in his car seat today. He'd mainly taken to wailing in his Graco seat for the past few weeks. Win, win, win!!!!! For the record, my husband was quite happy with this solution as well. As much as he loves cars and buying new ones, he easily saw the value in not trading up for a larger, less fuel-efficient vehicle. I'm personally a fan of new vehicles - very fuel efficient ones - due to my fear of breakdowns from earlier in life. My family is much more accustomed to the used vehicle approach. Yet, I do the same with the research! Even with my vacuum I got out my Consumer Reports and the internet and searched for the top 10, worth your $$, and one that met my specific needs - pet hair. This is a new concept to my hubby who is just now getting computer savvy. I'll keep up with my research though! @txtisha, I hear ya on the fuel efficiency - a big motivator for us NOT to get a bigger car! Speaking of vacuums, we still need to get a new one. Let me know what you find out!